Sensitive or Combination skin can be a nightmare. Flakey patches, redness, oily T-zone… sensitive and combination skin is unpredictable and emotional. Finding the right products to keep this skin calm can be a difficult and distressing game of trial and error. 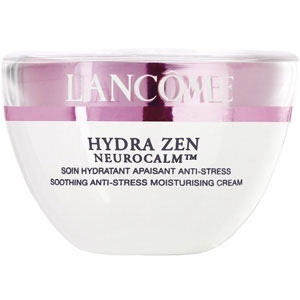 Lancome’s Hydra Zen Neurocalm is a “soothing anti stress moisturising cream” designed for all skin types, even sensitive. It costs £38 for 50ml. My skin is sensitive and temperamental. After years of working with skin care, I have my skin control regime in place,and I am happy with it. But I am always looking for good products for this difficult skin type which is becoming increasingly common. Hydra Zen has a nice light consistency. Ultra light to absorb, with no greasy residue. It is a good quality cream, and so only a small amount is needed. A light sweeping and tapping application sees this sink in beautifully. Skin feels refreshed and revived with hydration that stays through the day. Doesn’t cause oily patches or flakey bits. Redness reduced, and even my sensitive skin showed no signs of irritation. Hydra Zen has a clean floral fragrance which I did not find too synthetic or overpowering. It is light weight and non comodogenic which means it won’t block pores. Comes in a jar. Personally, I would recommend using a small spatula with this. For some people that’s a bit of a faff, but if you have the type of stressed out combination skin this cream is designed for, you probably want as little bacteria interference as possible. – MOISTURISES: Lipidure and Hyaluronic acid microcapsules, vectorised ceramides and Glycerol provide the skin with intense, long-lasting hydration. – SOOTHES AND RELIEVES STRESS: The NEUROCALM™ complex with natural plant extracts combats the negative effects of environmental and emotional stress. Samphire boosts the positive effects of stress by producing beta-endorphins, providing heightened moisturisation. – SOOTHING FRAGRANCE: Proven calming, anti-stress action. Excellent marketing. But upon inspection, ingredients wise, this cream is very basic and ordinary. No anti oxidants or SPF which is a huge sin for any cream looking for a long term relationship with my face. Also, the clear glass jar does expose cream to oxygen and light, which can effect performance of some key ingredients. Hydra Zen is a nice enough cream. It is moisturising, calming and non greasy. No gasps of amazement at the results, but no howls of horror either. I just feel that it lacks any ingredients to back up the substantial price tag. When you pay a premium price, you should be able to expect a premium result. And anyway, who wants nice enough? I want amazing.